The finest Safari boot made. Courteney Boots are known Internationally, designed specifically for the African Veldt. The Safari - an exceptional choice as a 'true' stalking boot. Slightly modified, four-inch ankle height boot, the Safari affords the very same features as the Selous with the same hand crafted construction and genuine Cape Buffalo hide upper and natural rubber tire tread sole. Brass speed lacing, padded Impala collar plus double stitched and reinforced vamp, provides an exceptional choice as a true; stalking; boot. As with the Selous, the Safari is designed and sized to fit ladies as well as gentlemen, and with a combination of outstanding durability and comfort. Note: Courteney Boots are made in English sizes. Therefore, please order half a size smaller to approximate your standard US size. The Frontier - designed expressly for customers who wish to have the Courteney construction with lower heel padding. The Frontier is available in: Buffalo and Black Ostrich. 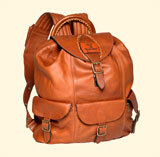 The Courteney Selous is constructed entirely of genuine gameskin, each is as individual as the serial number it bears. Select Cape Buffalo skins are hand stitched to form the incredibly tough uppers with a soft Impala skin padded collar surrounding the ankle and lower calf to provide exceptional support and comfort. The vamp is reinforced with overstitched heel and toe box and the entire upper is stitched through to the pure rubber 'tyre' tread sole for all terrain durability and surer traction. The Selous is presented in a Courteney Chronicle travelling sack together with a full range of accessories including polish, cloth, brush, spare laces and alternative innersoles, to keep them in perfect condition for your next adventure. 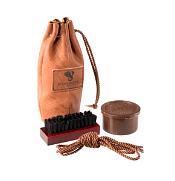 Includes a good stiff brush and exclusive Courteney boot polish made from pure beeswax, and comes packaged in a game skin bag. Entirely constructed using only African Impala hides, the Haversack features a drawstring top and oversized flap with a top carrying handle. Carrying the essentials in an organized and convenient manner has always presented a bit of a challenge. A tremendous amount of hunting experience was drawn upon to create a design which was truly useful for carrying a satisfactory amount of kit into the field. Entirely constructed using only African Impala hides, the Haversack features a drawstring top and oversized flap with a top carrying handle. The primary compartment provides ample room with suitable protection for binoculars as well as photographic equipment and valuables. Additional exterior pockets surround the lower pack. The fit of the bag has been properly constructed to permit the user a comfortable balance of weight, with padded shoulder straps (incorporating snap over pockets) that adjust quickly and easily. An excellent choice for safaris and expeditions. Click on the image to return Home.